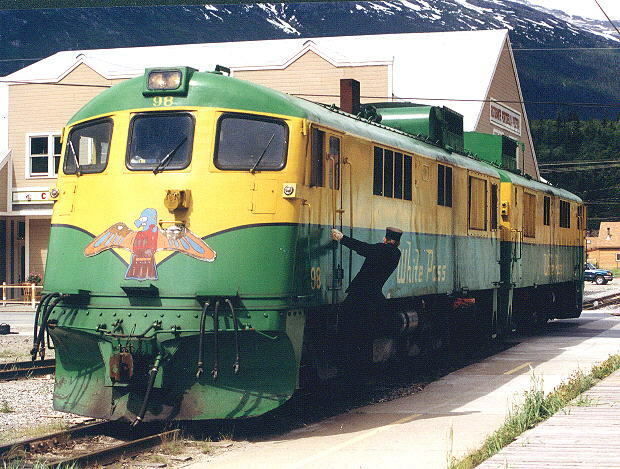 The White Pass & Yukon Railroad was built in response to the gold rush of the late 1890s in Alaska and the Yukon. 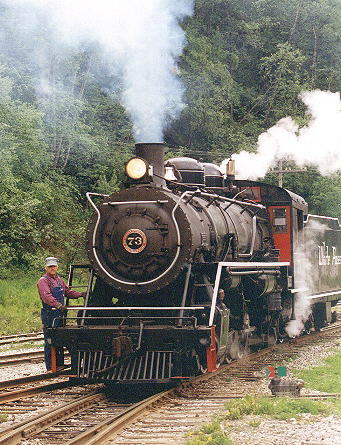 It was a joint product of British and American endeavour, a amalgamation of the American-backed Pacific & Arctic Railway and Navigation Company and the British-backed British Columbia Yukon Railway and British Yukon Railway companies. 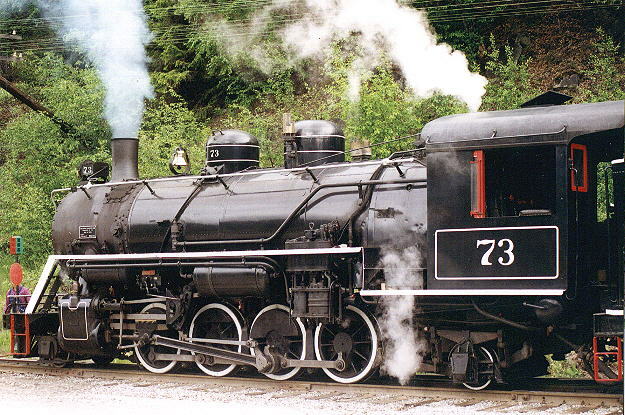 Construction commenced in 1898, running for 110 miles to Whitehorse, Yukon. 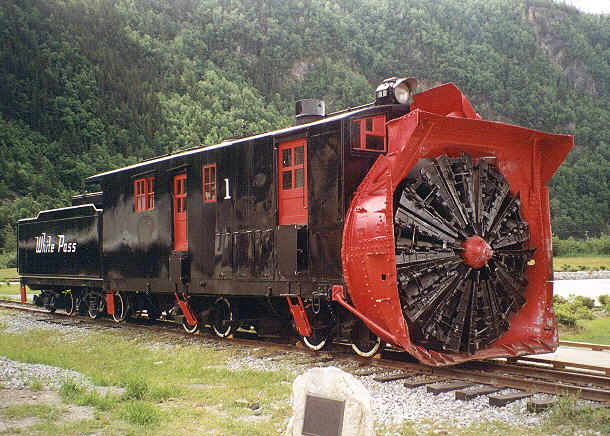 It was constructed in three foot gauge. 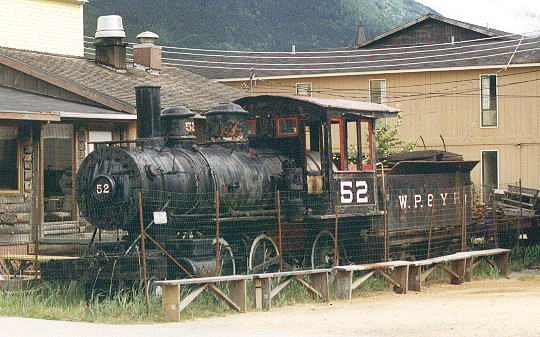 It opened in 1900 and ran for the next 82 years, carrying passengers and freight; gold, silver, lead and zinc ore made its way south to be shipped out at Skagway, while in the opposite direction went goods and machinery to supply the remote regions of the Yukon. 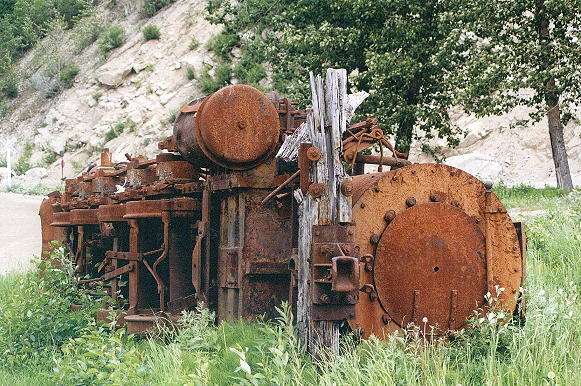 The Yukon mines closed in 1982 and along with them, the railroad. 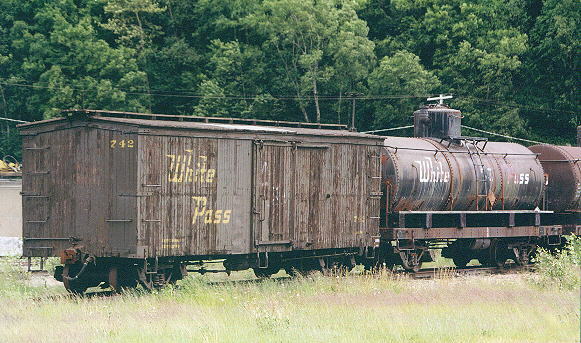 However the White Pass has always catered for the traveler and the pressure of tourism, coupled no doubt with local politics and economics, has brought about a reopening of the line. 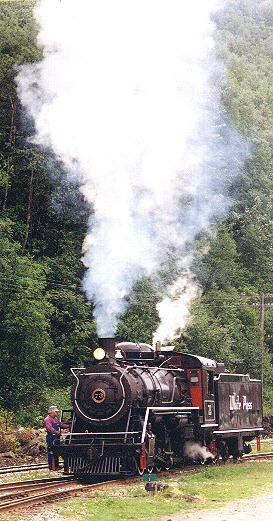 The following photographs were taken at Skagway on a single day in June 1999 and they feature both steam and diesel activity. The line's purpose nowadays is to serve tourists, particularly those like myself who come off the cruise liners traveling the Inside Passage from Vancouver to Glacier Bay or Anchorage. 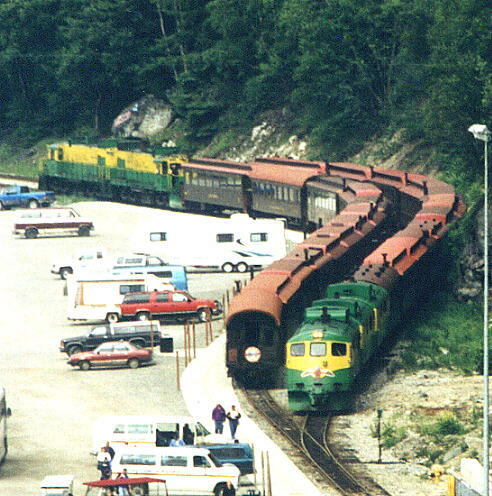 The ordinary tourist trains leave from the town station, formerly served by a track down the main street (diverted in World War 2) but now served by a branch off a line running behind the town to the cruise ship terminal. Cruise ship specials leave from the dockside. 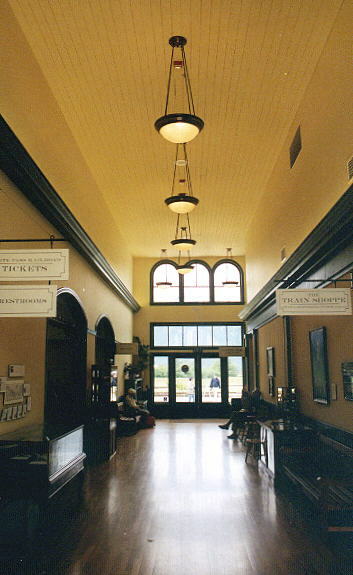 Skagway station exterior and interior. 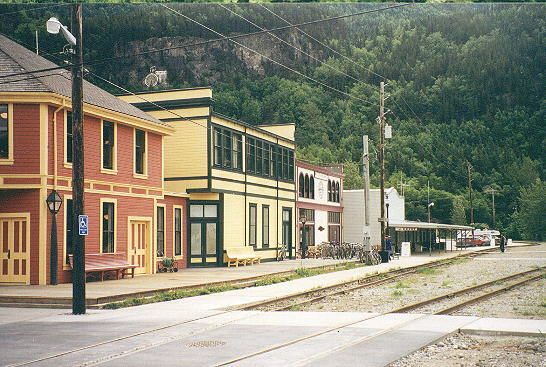 The track from the station curves round to the left to join the line from the quay and thence northwards towards Whitepass and the Yukon. The track formerly entered the station from behind camera. The quay handles the cruise liners which arrive two or three a day during the summer months. Each ship can carry up to 2500 plus passengers and crew which places a heavy demand upon the W.P.& Y.Rs facilities. 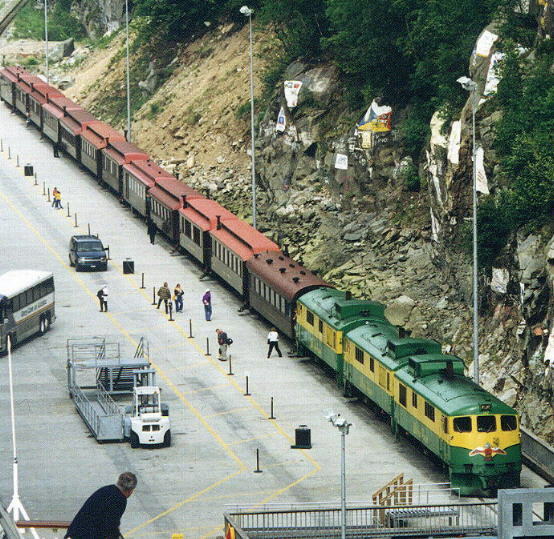 In these photographs, taken from the side of a ship, three '90 class' diesels, #97 leading, arrive at the quay side passing a pair of '100 class' locomotives removing empty coaching stock from the previous train. About a mile out of town is the depot which has running sheds and workshops, modern buildings which replace a traditional roundhouse burnt down in 1969. 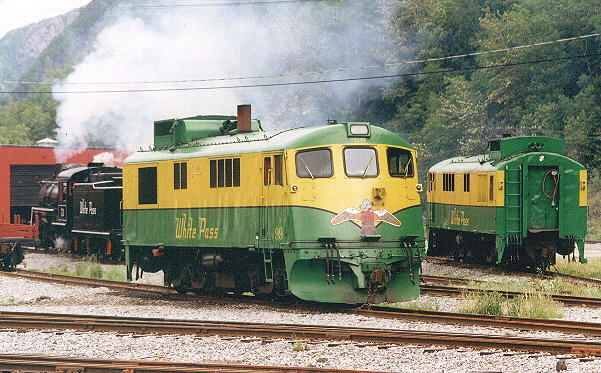 '90 class' locomotives #99 (facing) and #92 await a turn of duty, along with inspection car #2044. 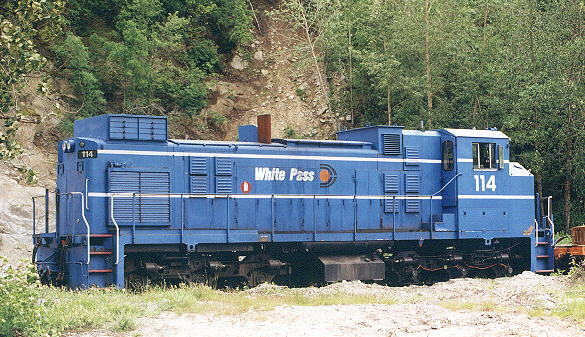 '111 class' diesel #114, waits in the depot yard with a permanent way train. As well as the remaining operational stock the depot is also a repository for relics of the past. 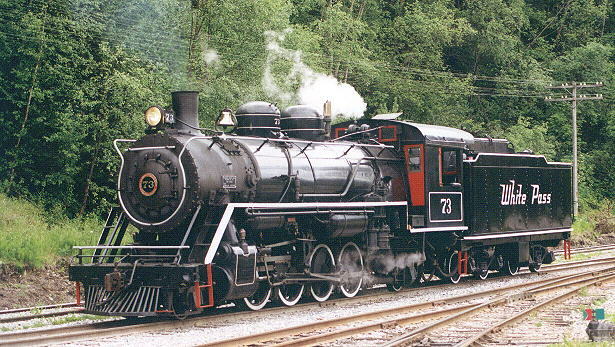 #114 poses near the remains of two steam locomotives, including old #61. Old freight stock is also represented in the yard. Other relics and reminders of the past crop up around Skagway. 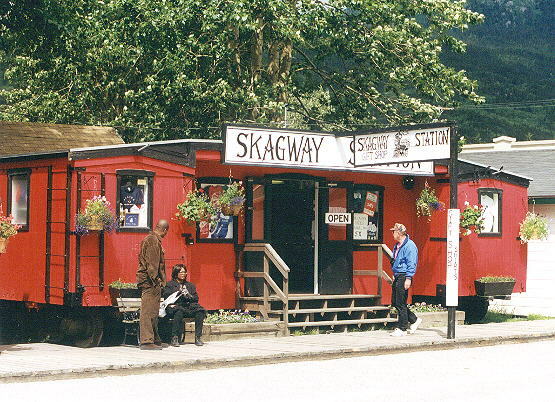 In the main street, a pair of box vans have been cobbled together to add yet another tourist outlet for Skagway's visitors. 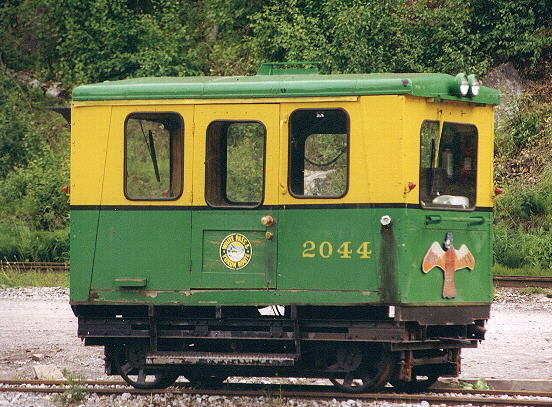 A good introduction to Skagway and the role of the W.P.& Y.R. in its development can be found in 'Gold Rush Gateway' by Stan Cohen, published by Pictorial Histories Publishing Co.,Inc., Missoula, MT; email to phpc@montana.com. The ISBN is 0-933126-48-4 and I am indebted to the book for the historical material on this site.